Qutb-ud-din Aybak (Persian / Urdu: قطب الدین ایبک) was a Turkic ruler of medieval India, the first Sultan of Delhi and of the Slave dynasty (also known as the Ghulam dynasty). He served as sultan for only four years, from 1206 to 1210, but had more or less run Muhammad of Ghor's Indian territory since the conquest of Delhi in 1193. Before he died, Aybak had started to build the Qutub complex, which remains as a permanent architectural legacy. This fused Hindu and Islamic styles although his Mosque is alleged to have replaced a Hindu Temple. The Slave Dynasty ruled from Delhi until 1290; the Delhi Sultanate continued until the beginning of the Moghul Empire in 1526. Six hundred years of Muslim power in India followed Qutb-ud-din Aybak's rule. The Muslim presence in India would see Hindu-Muslim conflict, violence and persecution of one community by the other—depending on who exercised power at the time. Yet, it would also see a meeting, mixing, and mingling of ideas, culture, spirituality, art and architecture that, at its best, shows how people of different religions can benefit from mutual exchange and from mutual respect. Qutb-ud-din Aybak, who commissioned the very first state-funded Muslim buildings in India, may have contributed to a negative legacy of destroying Temples. However, his buildings also combined Hindu and Islamic forms. While conflict has too often characterized Hindu-Muslim relations in India, Hindu Gurus have also attracted Muslims while their counterparts have attracted Hindus. Without denying that many Indians converted to Islam in response to missionary preaching, it was Aybak's Sultanate that provided Islam with a foundation on which Muslims built, making Islam India's second largest religion. This also gave Hindus and Muslims in India a chance to choose—between hostility or harmony. The choice of cooperation instead of conflict is always open, and peace-loving people will find ways to pursue the former, rejecting the latter. Qutb-ud-din was born somewhere in Central Asia; he was of Turkic descent. While still a child he was captured and sold as a slave (ghulam). He was purchased by the chief Qazi of Nishapur, a town in the province of Khorasan in northeastern Iran. The Qazi treated him like one of his own sons, and Aibak received a good education, including fluency in Persian]] and Arabic and training in archery and horsemanship. When his master died, his master's sons, who were jealous of Aibak, sold him to a slave merchant. Qutb-ud-din was then purchased by Sultan Muhammad Ghori, ruler of Ghor in north-western Afghanistan. Starting with his native Ghor, an Aimak principality, Muhammad Ghori managed to establish control over most of present-day Afghanistan, Pakistan and northern India sacking Delhi in 1193. He established the first verifiable Muslim administration through collection of state taxes, establishing the rule of law, equitable distribution of land and revenues to the nobles under his charge, and governance based on a mixture of locally elected representation through Mashura courts (consultative courts, from the Arabic "shura") and nominated administrators. Qutb-ud-din rose through the ranks to become Sultan Ghori's most trusted general responsible for much of the territorial expansion. His greatest military successes occurred while he was directly under Sultan Ghori's guidance and leadership. Qutb-ud-din was responsible for executing and consolidating Sultan Ghori's conquests in northern India. As Muhammad's viceroy for India, he was left in increasingly independent charge of the Indian campaigns and the exaction of levies from the areas in India that were under Sultan Ghori's conquests, as after 1192 Sultan Ghori concentrated on Central Asia. Muhammad Ghori established the first real Muslim state in North India. Upon Sultan Ghori's death in 1206, Qutb-ud-din Aybak, after a brief power struggle, emerged as ruler of the empire in Afghanistan, Pakistan, and northern India; Ghori's Central Asian possessions had been captured by the Mongols warlord, Genghis Khan. 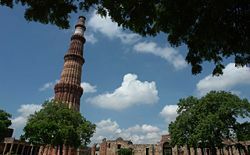 The Qutab Minar, now a World Heritage Site in India, was built during his time.
. Keay describes Aybak as Muhammad's "likeliest successor." Other monarchs may have one son, or two sons; I have thousands of sons, my Turkish slaves who will be the heirs of my dominions, and who, after me, will take care to preserve my name in the Khutba throughout these territories. Qutb-ud-din Aybak initiated the construction of Delhi's earliest Muslim monuments, the Quwwat-ul-Islam mosque and the Qutub Minar. Historical records compiled by Muslim historian Maulana Hakim Saiyid Abdul Hai attest to the iconoclasm of Qutb-ud-din Aybak. However, he also began the tradition of fusing Hindu and Islamic styles; the mosque he had built has a "colonnade of richly sculptured Hindu pillars." Even Quranic calligraphy was nestled into "dense Hindu-style foliage." Necipoglu, however, says that in order to build the mosque, a Hindu temple was destroyed. 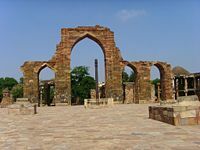 Keay attributes the destruction on Hindu temples to Muhammad of Ghor and his heirs in the Delhi Sultanate, which some later Moghul rulers emulated. "Waves of iconoclasm," he says, "under Muhammad of Ghor and the Delhi Sultans account for the disappearances of many … North Indian temple complexes of the tenth to twelfth centuries." Yet, Qutb-ud-din Aybak did not hesitate to employ Hindu artisans to carry out his projects. Some of the pillars and other materials used in constructing the Great Mosque were taken from temples. The Qutub complex was completed by his successor, Iltutmish. Aibak, was otherwise known as "Lakh Baksh" or "giver of hundred thousands" because of his generosity. He was thus a pious Muslim, praised by contemporary Muslim clerics. He patronized scholars such as Hasan Nizami and Fakh-i-Mudabbir, both of whom dedicated their works to Aibak. Under Aibak, India became "for the first time the seat of" Muslim rulers, who previously had raided and plundered from Afghanistan. Qutb-ud-din died accidentally in 1210. While he was playing a game of polo on horseback (polo or chougan in India), his horse fell and Qutb-ud-din was impaled on the pommel of his saddle. He was buried near the Anarkali bazaar in Lahore. Shams-ud-din Iltutmish, another ex-slave of Turkic ancestry who was married to Qutb-ud-din's daughter, succeeded him as sultan of Delhi. Qutb-ud-din Aibak's tomb is located behind Anarkali bazaar today. In the early 1970s, it was renovated at the orders of the then Prime Minister Zulfikar Ali Bhutto. Six centuries of Muslim rule in India followed Qutb-ud-din Aybak. The slave dynasty lasted until 1290. The Sultanate itself lasted until 1526, when it was replaced by the Moghul Empire. This lasted until 1857, when it was wound-up by the British Raj. With the establishing of a permanent Muslim government in India, Islam started to attract more converts, becoming over time the second largest religion. Even after the Partition of India, Muslims in India are the third largest Muslim community in the world. Aspects of Qutb-ud-din Aybak's legacy, such as his fusing of Hindu and Muslim styles and willingness to employ skilled Hindu artisans to create India's first state-funded Islamic monuments, contributed to a tradition of Muslims and Hindus living, at times, harmoniously in India. At such times, Hindus and Muslims have chosen to view each others' religions as expressing different, perhaps even apparently contradictory, truths about God while affirming that the totality of who God is eludes human comprehension. However, another aspect—or alleged aspect—of Qutb-ud-din Aybak's legacy involving the destruction of Temples has informed times when one community has persecuted the other. At these times, Hindus and Muslims have chosen to view the others' religion as inferior, false or even as dangerously corrupt. For better or for worse, either approach was made possible because Qutb-ud-din Aybak established Muslim government in India. Those who believe that the end-goal of human maturation through all the processes of history is the establishment of a unified world of peace will encourage all people to adopt the first option, to accept that God has "revealed God's-self through the many religions of the world" in order to remind "humanity that the totality of God, or of the Ultimate, can not be reduced to a single formulation, and that paradox lies at the heart of God, since apparently contradictory understandings of God's nature can all be true." It is only when previously isolated communities become aware of each other, often as a result of imperial conquest, that humanity has the chance to mature towards achieving the goal of a unified world. ↑ Peter J. Claus, Sarah Diamond, and Margaret Ann Mills, South Asian Folklore: An Encyclopedia: Afghanistan, Bangladesh, India, Nepal, Pakistan, Sri Lanka (New York: Routledge, 2003, ISBN 9780415939195), 52. ↑ Frances Pritchett, 1200-1299, Columbia University, Indian Routes. Retrieved October 17, 2008. ↑ Necipoglu and Bailey (2006), 17. ↑ Fred S. Kleiner, Richard G. Tansey, Christin J. Mamiya, and Helen Gardner, Gardner's Art Through the Ages (Belmont, CA: Thomson/Wadsworth, 2004, ISBN 9780534640910), 749. ↑ Clinton Bennett, In Search of Solutions: The Problem of Religion and Conflict (London, UK: Equinox Pub, 2004, ISBN 9781845532390), 9. Hunter, William Wilson. 1882. 2000. The Indian Empire; its History, People and Products. London, UK: Trübner. ISBN 9780415244954. Keay, John. 2000. India: A History. New York, NY: Atlantic Monthly Press. ISBN 9780871138002. Necipoğlu, Gülru, and Julia Bailey. 2006. Muqarnas: An Annual on the Visual Culture of the Islamic World. Leiden, NL: Brill. ISBN 9789004154926. Pande, Rekha. 1990. Succession in the Delhi Sultanate. New Delhi, IN: Commonwealth Publishers. ISBN 9788171690695. India: The early Turkish sultans. Slave Dynasty and the beginning of the Delhi Sultanate. This page was last modified on 20 June 2015, at 16:52.